Overview information about Rio Grande and Bosque improvements. Proposed improvements will not impact the Bosque's environment any more than routine maintenance. The project will improve access to the Bosque for everyone and eliminate "rogue trails" that are harmful to the existing environment. The City hired SWCA Environmental Consultants to conduct environmental monitoring in the project area. Initial findings show the Bosque is in need of management and restoration. View more about the study's findings. A preliminary survey was conducted Thursday, May 7, at the Phase 1 transects closest to Central Avenue on both sides of the river. The City also hired Dekker/Perich/Sabatini and their team of planners, engineers, designers, scientists, and economists to evaluate conditions, reach out to the community, and develop concepts that will protect the Rio Grande while making it an integral part of our lives. The intent of this project is to minimize the impact on the environment while improving access. In order to create a design that will achieve these goals, scientific monitoring of the project area is currently underway. Analysis of initial monitoring influenced the design of enhancements. Monitoring will continue during and after construction to help create a better understanding of how enhancements may impact the environment, and how they should continue in the future. Connecting people to the Rio Grande & Bosque through recreation, education, stewardship and other quality of life opportunities. Protecting the Bosque through restoration and conservation projects. Providing people with new ways to enjoy this wonderful natural resource. Public input and suggestions about recreation management in the Bosque is important for future planning. 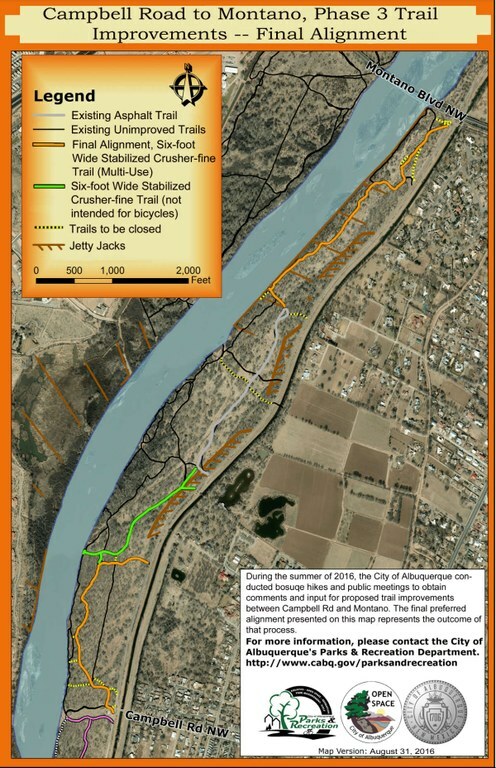 Future phases of the project are expected to include parking-lot improvements at Central Avenue, extending the trail to Montano Blvd., a bridge over the siphon east of the river between central Avenue and Interstate 40 and access improvements from the parking lot at Tingley Beach to the Bosque. Public hikes in the Bosque were June 11, 18, and 25. The Bosque Working Group is scheduled to met July 29. A public meeting date was held Aug. 11 at the Los Duranes Community Center. Phase III of this project was completed in December, 2016. See "Recent Updates" below for more details. View compiled comments on proposed Phase 3. In November and December 2015, the City conducted three public hikes with a total of 80 people in attendance. Alignment options and the project schedule were published on the City's website December 21, 2015. On Jan. 7, the city held a public meeting to present the alignment options. The meeting was advertised for 19 days and was a success with nearly 200 people in attendance. On Aug. 11, 2015, held a public information meeting at Los Duranes Community Center about the multi-use access path. Download the transcript from the Aug. 11, 2016 meeting. 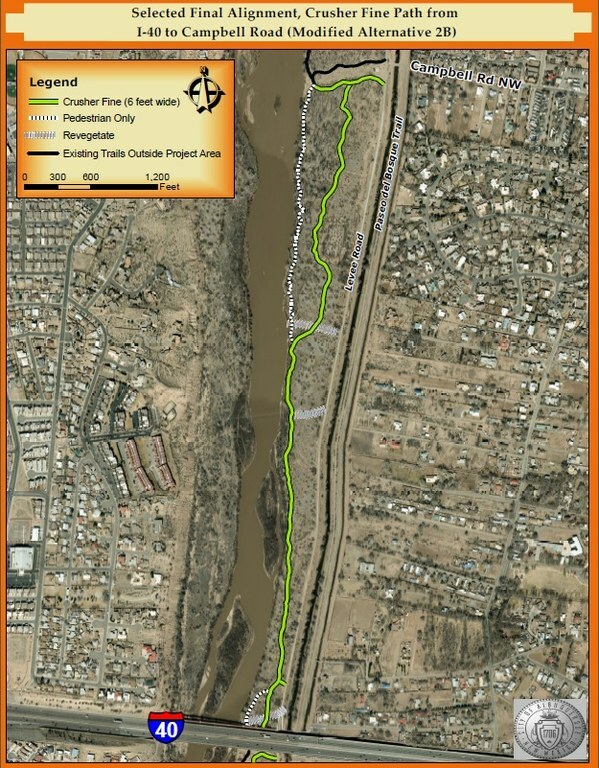 Phase I: The City of Albuquerque Parks and Recreation Department is pleased to announce that the trail improvements in the Rio Grande Valley State Park from Central to Interstate 40 on the east side of the river are complete. The maps below illustrate improvements to an existing man-made trail by placing crusher fines (crushed rock and dirt) on top of it. The 6-foot-wide stable surface will allow a mother with a stroller or a person with disabilities to experience the Rio Grande. This plan also implemented a restoration movement that includes planting of native vegetation on (i.e. willows, grasses, cottonwoods) and closing some trails that were made by people trampling through the vegetation to get to the river. These man-made trails are killing the native plant life and eroding the area. Open Space Division crews and volunteers used hand tools to complete the work through Summer 2015. Phase II: After much consideration, a preferred path alignment was chosen for the Bosque between I-40 to Campbell Rd. This decision was made after an environmental study was conducted and public input was considered. The preferred route is a variation of Alternative 2B, which was presented at the public meeting on January 7, 2016. 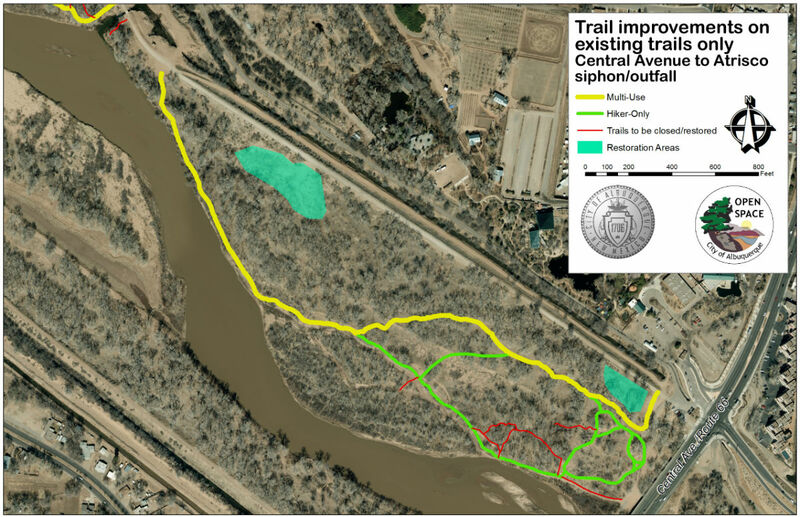 This route is designed to avoid sensitive areas within the Bosque. The City would like to thank the Middle Rio Grande Conservancy District, US Army Corps of Engineers and the U.S. Fish and Wildlife Service for their guidance and cooperation throughout the planning process. Construction began February 15, 2016. The path was finished well before the bird nesting season, which started April 1, 2016. Phase III: This phase kicked off with pubic hikes in the Bosque on three dates in June, 2016. Phase III was completed in December, 2016. Since August, crews worked in the Bosque, between Campbell and Montano, to complete a six foot crusher-fine path. 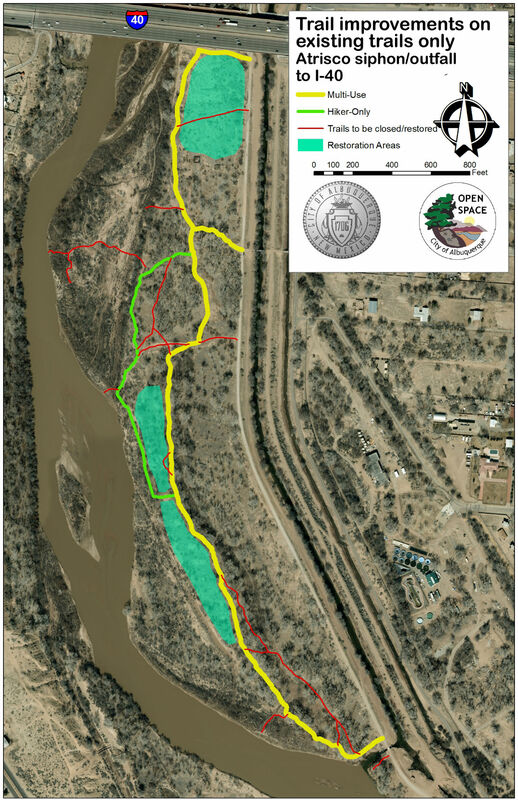 This path was completed ahead of schedule and allows greater access to the Bosque for individuals who use wheelchairs or other devices like strollers. The crusher-fine path was completed ahead of schedule. This phase cost approximately $524,000 to complete. The Bosque improvements continue with work in the Tingley area. An ADA accessible path will be constructed, leading to the Tingley Beach overlook. Crews will also begin renovations on the Atrisco Siphon Bridge. This work is expected to be completed by spring 2017.